Every year I get invited to meet with and/or offer support to organizations that bring groups of students here from all over the world. 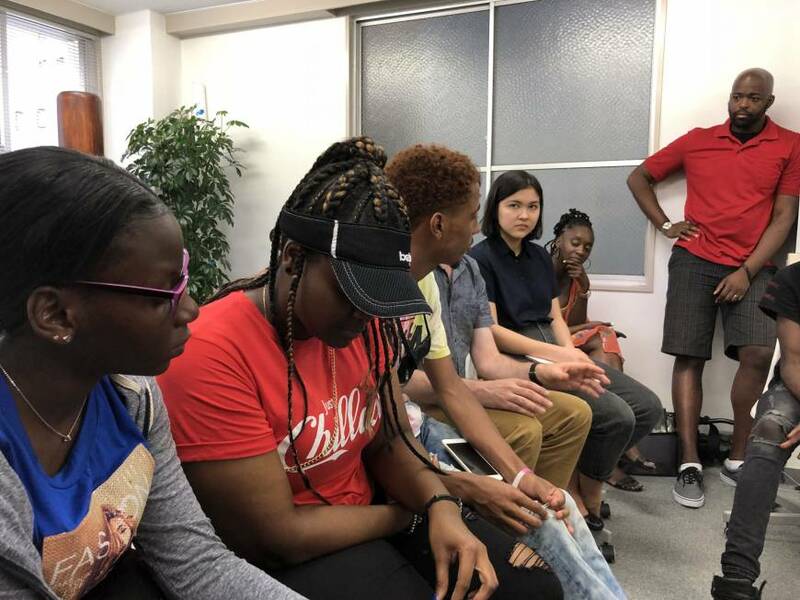 The Tomodachi U.S.-Japan Youth Exchange Program and African American Youth Travel Program both fly in young people from the States, and Deakin University does the same for Australian students, just to name a few. I’m still in touch with some of the students I’ve met with over the years. One of them is even here now, interning for me this summer. So, if there’s anyone who questions whether these types of programs are effective, trust me, they can make an enormous difference. The closest I ever got to The Talk (as it pertains to expat-dom in Japan) was from the eikaiwa (English conversation school) I worked for when I first arrived. Basically, some equivocating HR person told us new jacks: “Please be patient with the Japanese. They are a homogenous people, so they tend to have certain, er, xenophobic tendencies.” I could do better than that bound and gagged. And the second reason: Spending time with fresh minds tends to rekindle my tinder, so to speak, by allowing me brief moments of vicarious delight, reminding me of the thrill I felt, and the charm Japan held, when I was fresh from the outer world — a periodic revitalization I’ve come to depend on for sanity maintenance, quite frankly. Back in March, I couldn’t go on the internet without running into the name Eric Jordan and discussions of the mission he was on to raise money to bring some less-than-privileged students from Brooklyn, New York, to Japan — such was the appeal and penetration of his campaign into the Japanosphere, particularly its black circles. So, I made it my business to get to know the man, and to get his back. Bijoun Eric Jordan, 36, has been a teacher for the past 14 years. He currently teaches English at the Frederick Douglass Academy VII in Brownsville — an area of Brooklyn even I, a lifelong Brooklynite, was wary of, and with good reason. Every black neighborhood in Brooklyn has a motto. My Bedford-Stuyvesant’s motto is “Do or Die!” Brownsville’s is “Never Ran, Never Will!” but us Bed-Stuy heads used to mock that, saying, “Never Had, Never Will!” — from a safe distance, of course. In the Brooklyn of my day, the rugged pre-gentrification days, Brownsville was by far the hairiest neighborhood in the borough, arguably the entire city. This is the neighborhood that churned out Mike Tyson, for chrissakes. But, beyond the call of duty, Jordan has taken on the task of ensuring his students prevail over that adage by giving them the opportunity to do what few youths in Brownsville get the chance to do at such a young, impressionable age: to soar beyond the confines of “Never Will” and into the realm of unlimited prospects, where even a few days can make a world of difference. To fly, feed and accommodate himself, three chaperones and 15 students, Jordan needed to raise over $58,000! And, using a combination of fundraising activities — including an art auction and crowdfunding through a GoFundMe page — and with the support of a global community, he did just that! The first time Jordan and I spoke, he was mid-grind, his mind in three productive places at once, but after only a few moments of talking I threw my support behind the project, promising that everyone within my sphere of influence would at least be aware of this undertaking. He was that kind of impressive! I interviewed him via Skype and it was clear to me that he understood this trip was not some kind of juvenile junket to Japan to see temples and eat sushi and such, but about these vulnerable youth gaining some perspective and making connections with a world outside the domain circumstances had relegated them to. Several serendipitous weeks and $61,000 later, I went to meet Jordan and the students at a roundtable meeting at the Ginza Hub co-working space in Tokyo. In attendance were expats in various professions, including sales and marketing, nonprofits, film, video production and YouTubing, who all shared with the students the insights they’ve garnered over the years as they’ve achieved success in their respective fields in Japan. We broke bread that evening, and over yakiniku Jordan told me about how he’d first caught the travel bug. He’d been on the precipice of beginning his professional life when he met his first Spaniard, and his life took a left turn that wound him up in Spain. In 2017, hoping his students might have a similarly life-altering experience, he raised enough money to take a group of 10 students to Spain for a week, revisiting the places he’d lived in Barcelona and Madrid. With that success under the belt, he set his goals for 2018 even higher: To take more students to a more extrinsic locale, a feat that would require far more funds to actualize. The trip would have them bouncing from Tokyo to Kyoto and Osaka with stops in several cities along the way, in what I’m sure was a whirlwind that dazed the teens, most of whom had barely ever left New York City. 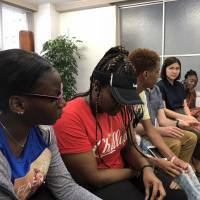 But for many of the students, the most engaging aspect of the journey was the time they got to spend hanging out with Japanese teens. This leg of the journey, organized by Nobuaki Tanaka (a filmmaker based out of NYC), took the group to Hakone, where they visited students from a local school. Fermin, 17, really dug that part of the trip. The chaperones also came away from the experience impressed by certain aspects of Japan. Toni Todd Sweat, 43, a colleague of Jordan’s at Frederick Douglass (and a stone-cold Brooklynite — we chatted up Brooklyn so long I almost got lost down memory lane) had some interesting observations. Catching up with Jordan after the trip, he told me he was playing the long game. “I have to remember that at the end of the day, this was mission accomplished,” he says. “The students did get to have this experience. But this is something that really takes a while for its impact to truly take effect. With this success under his belt, Jordan has set his next goal even higher. With Europe and now Asia out of the way, he has his sights set on visiting six continents in six years. The students have already expressed an interest in seeing Australia and several African countries. “I live by those words,” I told him. “We all should!” he says. Whether or not Jordan has succeeded in impressing upon these students that by keeping their heads up, they too can succeed, remains to be seen. But at a minimum, he’s shown them that the sky’s the limit and that they have wings that’ll take them where they need to go. Only time will tell if they’ll put them to industrious use. If you’d like to support the trip that Jordan’s planning for the students next year, you can contribute at www.gofundme.com/Br2Jpn. Baye McNeil is the author of two books on life in Japan. See www.bayemcneil.com.